When shopping for solutions, people’s minds are usually racing. As marketers, our aim should be to guide our prospects through this process towards the “destination” of making a purchase. The effectiveness of this, however, depends heavily on our ability to understand people’s needs while shopping and persuading them. While often referred to as an “art,” persuasion has been studied extensively in science and there are many proven techniques we can use to achieve our goals. In The Persuasion Slide - A New Way to Market to Your Customer's Conscious Needs and Unconscious Mind: Use Psychology and Behavior Research to Influence and Persuade, Roger Dooley, marketing speaker and author Brainfluence and the popular blog, Neuromarketing, offers a simple way of looking at the persuasion process as essentially a framework for an effective marketing funnel. 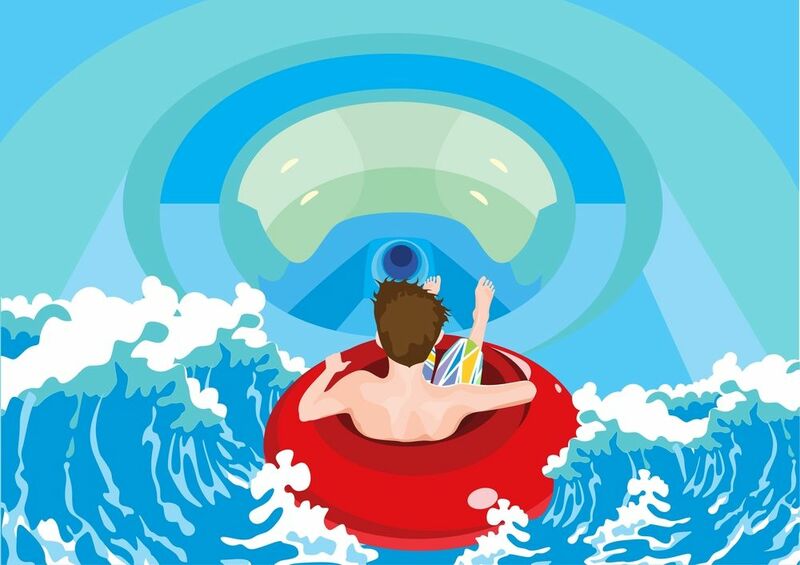 To get an idea of what the Persuasion Slide is, imagine a slide on a playground (or a luxurious water slide considering this with your prospect sitting at the top. Maybe at first they’re a little scared; reluctant to make a move, but the more you persuade them and offer reassurance, the more comfortable they will feel moving down the slide until they reach the bottom and make a purchase. In order to accomplish this, there are four factors at play that you must understand and control. In this model, gravity represents the prospect’s needs, wants, and desires. In this case, gravity is provided by them. 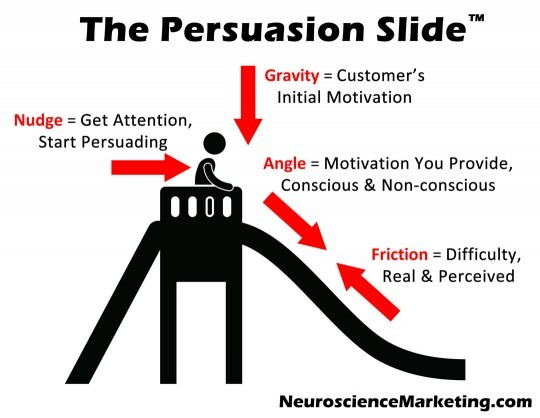 Your goal is to figure out how to use their gravity to push them down the Persuasion Slide. This is why copy such as “Fill Out This Form” isn’t effective on a lead generating landing page. Where’s the motivation? Why should your wish be their command? To get people to take action, you need to give them gravity if it doesn’t exist. To go back to our form, you can say something “Get a Free Demo” or “Get My eBook.” Copy like this more tempting and gives people a compelling reason to follow through with what you’re asking. As your prospect sits at the top of the slide, they are on a small flat surface. They aren’t going to move unless they move their momentum forward or someone pushes them from behind. This is the nudge in the Persuasion Slide. A nudge catches their attention and sparks interest. It’s anything that starts the motivation process in your prospect’s mind and forces them into action. The nudge could be a CTA, a marketing email, a promotional sign in a retail store, or a social media post. In inbound marketing, your nudge is ideally a remarkable offer or lead magnet. Going back to the playground slide analogy, imagine the angle at which the slide is positioned. The steeper the slope of that angle is, the easier (and faster) a person can slide down. In the Persuasion Slide model, the angle is determined by the strength of the motivation you provide (the overall value). If the value you provide isn’t strong enough, the prospect will start to slide and then stop. Dooley categorizes this into two types of motivation: Conscious and Non-conscious. Conscious motivators are what we as marketers focus on – features, benefits, value proposition, price, etc. These are the things that appeal to the rational decision-making part of your prospect’s brain. While these factors contribute very little to persuasion, they help your customer justify their emotional purchase, which is especially important in B2B marketing. Non-conscious motivators are the things that appeal to your prospect’s emotions – reciprocity, authority, status, etc. According to Dooley, other factors, such as our brain’s aversion to loss and avoidance of things that require deep analysis, also fit into the non-conscious motivator area. A truly effective Persuasion Slide uses both conscious and non-conscious motivators to create a steep angle. Have you ever seen a kid get stuck halfway down a slide because the angle wasn’t very steep or the slide wasn’t slippery enough? The reason they stopped was because there was too much friction. In the Persuasion Slide model, friction represents a difficulty, frustration, or challenge, some real and some perceived. We often call these barriers and they can include anything that causes confusion or imply work or obligation like forms with too many questions, poor user interface, long payment processes, unclear product descriptions, etc. Whether the source of friction is real or imagined, the end result is the same. You want to eliminate friction at all costs. Click "keep reading" below to unlock a simple 5 step process of how to build a Persuasion Slide with your inbound marketing.